Save time by automating payments and statement processing with the BPS. 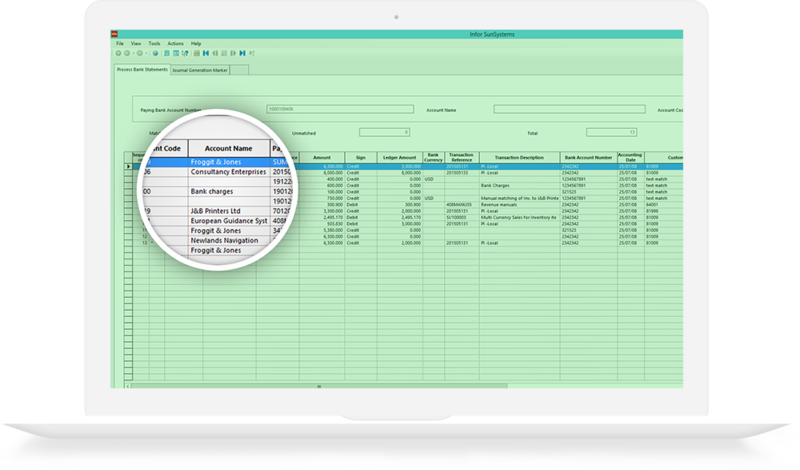 Generates outgoing payment files and handles incoming statements, matching incoming payments to debtor invoices. Automatically books any minor differences in payments. Automatically generates journals for bank charges, interest payments, and other charges. Maintains an audit trail of all payments and authorisations. The BPS posts bank fees and other charges automatically with all appropriate analysis codes. We like the BPS system, because it is easy to use and is seamlessly integrated with SunSystems. Online processing of payments saves us a lot of time in comparison with the man-days needed in the past. What we like most is the statement processing with its automatic matching of payments to open items as well as direct payments. Its self-learning mechanism and posting presets make the process quick and accurate with practically no space for any potential human errors. In October 2012 3M in Slovakia experienced a major organizational change when it transformed from a branch office to an independent subsidiary. Since then, our newly formed financial department has taken over a wide range of financial and accounting operations which were not processed locally in the past, including regular monthly reporting. We have been using SunSystems accounting software with its Bank Payment System module for one year already, and we highly appreciate its accuracy and functionality. In the meantime, we can’t imagine our daily operations and monthly closing being faster without it. The Bank Payment System significantly shortens the time it takes to book and match bank statement transactions, both receivables and payables. In both cases, it directly saves transactional costs (bank fees) using the summary payments functionality. 3M has its subsidiaries all over the world. In a CEE region there are two other countries with a similar set-up of financial processes – Bulgaria and Romania in which Bank Payment System was also successfully implemented thanks to its intelligent country-by-country parameters. We have been using BPS for many years. We started with implementation in one company and ended up using it across all our companies and countries in region. The key factor for roll out was the statement processing part of the system which differentiates the BPS form other available systems and which we can confirm “really works.” Each country and every bank needed a different approach but with Bank Payment System we were able easily to succeed thanks to the customer-oriented method of implementation. We have been using the Bank Payment System with SunSystems 4 for several years. We have a large number of customers – both corporate and individual – and we process over 50 bank transactions using BPS each day, avoiding double entry of data. Transactions are booked in SunSystems after completion of the BPS processes. A number of operations including bank charges are successfully detected and booked automatically in SunSystems. The main reason why we chose the Bank Payment System was to avoid double entry and additional reconciliation, and because the BPS recognises commissions that Citibank doesn’t show separately in statements.